Sajnekhali Watch Tower – This watch tower gives out a beautiful panoramic view of the Sundarbans. At the same time, you can also watch out for tigers, deer as well as other animals. 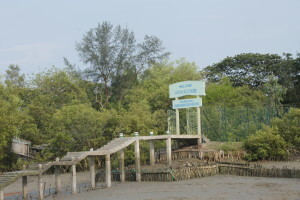 It is a popular tourist destination and the forest office situated in there can issue permission so as to visit other places in the Sundarbans. There is also a hall that has the choicest display of of various photographs of birds and animals alike shot by the forest officials.